Dr Who star David Tennant was the main attraction as about 18,000 people gathered in Blackpool for the switch on of the world-famous illuminations. Natasha Bedingfield, McFly, Natalie Imbruglia and Gareth Gates were among the artists performing at a concert ahead of the main event. The Timelord actor flicked the switch at the end of the show, which was broadcast on BBC Radio 2. Dale Winton presented the special hour-long live broadcast. The illuminations, which cost more than £2.4m to stage, will shine for 66 consecutive nights until 4 November. More than 500 scenic designs feature in the display which stretches almost six miles from Starr Gate to Bispham. Designer Laurence Llewelyn-Bowen created a section of lights called "Decodance" which are positioned in the heart of the resort, next to Blackpool Tower. 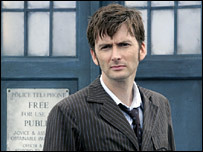 Tennant is following in the footsteps of fourth Doctor Who actor Tom Baker, who switched the lights on in 1975. As he turned on the lights, the actor joked: "Red Rum once did this with his hoof. "I'm delighted to be following in the hoof-steps of Red Rum."